Today I'm launching a series called Fab Friday... each Friday morning I'll post a single image that especially caught my eye during the week. And what better way to kick off the series than with a new piece by Yulia Brodskaya? This amazing babushka is yet another reason to be bowled over by Yulia's talent. Yulia says, "This artwork is the first piece in the series of works which I consider a declaration of love to the material and the technique. 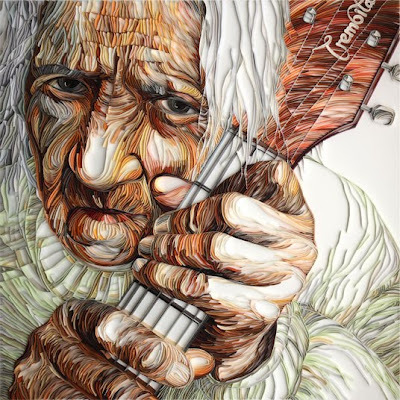 It is also an attempt to raise a profile of this paper craft, which has been previously regarded with some disdain, and to bring this type of artwork on a new level in terms of its ability to convey meaning and emotions"
Yulia, without a doubt your work is bringing superlative attention to quilling. Yulia at her amazing best and what an inspiration she is .I am so awe struck! incredible. thank you for sharing, ann. Truly a WOW! I'm off to visit Yulia's site. Love the idea for the new series, and what a perfect image to start with. WOW! Great new series Ann. Yulia is an amazing talent and we could not have a more talented representative of our craft. I am grateful for her talent and her dedication to quilling. Words fail me ... amazing! Ann, you are phenomenal. Thanks for keeping all our fingers on the pulse! Keep up the good work! your works is splendid Beautiful!!! WOW! I couldn't even *imagine* that, let alone creating it with just paper. What talent Yulia has! simply breathtaking! a whole other level all together. thanks for spreading her again. Every time I see Yulia's incredible work, I can't imagine how she can top herself. I'm blown away! Thanks Ann. Now that's paper art! Exquisite. Absolutely breathtaking. So dimensional and deliberate! What an amazing piece! Thanks for showing us that quilling has life beyond greeting cards! Yulia's work is always amazing. I went to her page the other day, Ann, to get some much needed inspiration. I saw this and was blown away. I had to go back later that day just to make sure it was paper. She sure does have the exposure now. Her creativity is unbelievable, WOW! Her quilling is stunning. I'm always amazed by her work. yulia has shouw everybody that paper quilling is indeed a serious form of art!!!!! Just one word: Amazing !